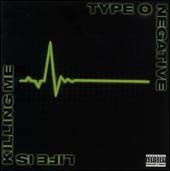 It's been 4 years since Type O Negative has delivered a full-length studio album. I was very eagerly anticipating the release of Life Is Killing Me as it was supposed to herald a departure from the bleak dirges of World Coming Down and a return to the Bloody Kisses / October Rust sound that fans of Goth Metal can't get enough of. The album arrived and I, almost reverently, slide it into my CD player - to find disappointment. Where was "Christian Woman"? Where was "Be My Druidess"? Where was the return to the sound that I had been longing for? Then I played the album again and the subtleties became less subtle. Life Is Killing Me is not a clone of Type O's most successful albums but an even further refinement of the bands unique Goth Metal style, taking the best elements of those aforementioned albums and combining them to create a disc which delivers that recovery from World Coming Down that I had so hoped for. Since Bloody Kisses, Type O has traditionally led off each album with some sort of brief aural jape. Life Is Killing Me strays only slightly from the traditional with "Thir13teen", a bit of music from "The Munsters" TV show played as only Type O could. Right on the heels of this intro is "I Don't Wanna Be Me", a song that can best be described as pop-punk of the sort currently fashionable on America's "alternative" radio - but incorporating all of the standard Type O influences such as the lush keyboards of Josh Silver and the ultra-fuzzy down-tuned guitar of Kenny Hickey. This song is the most accessible of the album and a likely candidate for radio airplay. "Less Than Zero" draws heavily on late-60's Beatles psychedelia, incorporating instruments such as the sitar and tambura into the mix. A groovy little riff introduces us to "Todd's Ship Gods (Above All Things)", a candid glimpse into mainman Peter Steele's relationship with his father. This song is an excellent example of the overall mood of Life Is Killing Me - catchy riffs and memorable choruses masking dark, somber lyrics producing feelings of hopeful despair and joyous sorrow. One of the key elements to Steele's writing is his sarcastic and most often in-your-face sense of humor. "I Like Goils" is his tongue-in-cheek response to the occasional interest shown him by members of the homosexual community. Here again Type O display a very punky sound without compromising their core Goth style. Former Type O skin-pounder Sal Abruscato returns to provide backing vocals on this track. Steele demonstrates his talent with the bass on "...A Dish Best Served Coldly", a song which he describes as a revenge anthem and one which fits in with the bands more doomy ambiance. The title track, a very disdainful look at the greed and sense of detachment that pervades the medical care industry in America, is classic Type O with unconventional and complex song structures built upon Josh's lush keyboards and Steele's multifaceted baritone. Where "Todd's Ship Gods" dealt with Steele's relationship with his father, "Nettie" is a somber tribute to his mother's life and, ultimately, her struggle with impending mortality. Steele digs to the deepest register of his powerful voice yet at times reaches back up to his melodic mid-range delivery, enveloping the listener in "real" emotion. Certainly the most emotionally moving track on the album. "Electrocute" is a very popish Goth-rock tune combining more Beatles-style psychedelia with Silver's elegant keys and Steele's sing-along choruses. Lyrically, Steele laments about the lost love of a girl from Coney Island - sound familiar? Another Type O tradition has been the inclusion of one cover song on each album since Bloody Kisses. On Life Is Killing Me, we're treated to the bands rendition of "Hedwig's Angry Inch". Not really up to par with "Cinnamon Girl" or "Summer Breeze", the Drab Four's version is still quite amusing and fitting, given their slightly skewed sense of humor. Wrapping up the album is "The Dream Is Dead", a plodding yet melodic grieving over love gone sour. For fans of Type O Negative, purchasing Life Is Killing Me is a must as this is clearly their best album since October Rust. Those not already familiar with the bands dark, cynical attitude and truly unique style of Goth metal may want to start with the Bloody Kisses and October Rust albums before being able to fully appreciate the intricacies of their latest opus.